This week is my third full week of following a training schedule and already I'm running into setbacks. For starters, I'm 99% sure I have pleurisy again, which is some weirdo Little House on the Prairie disease. It's probably because I'm from Le Sueur (kidding, hicks). Imagine a knife stabbing you under your clavicle and in your back when you take a deep breath. It's painful. I started to feel it big time after yoga on Monday night, ignored it on my run on Tuesday and yet again last night as I pounded out a "quick" four miles on treadmill. Today, though, there's no ignoring it. Every laugh, every cough, every deep breath hurts. I could go to the doctor but truthfully there isn't anything they can do for it. It's just pain and it's not going to kill me but it makes me want to punch my lungs in the face. So Thursday night after Julie's, I brought Colleen home and went it for a cocktail and to watch The Office. The pain I was feeling seemed to be getting worse and I joked with Colleen that she'd have to drive me to the Urgent Care. We actually looked up their hours and when we saw they closed at 11 p.m., I decided I would wait it out until they re-opened at 8 a.m. and just go home and try to sleep. When I got home, I put a heating pad on my chest and tried to get comfortable (and obviously never finished the post I started). Around 2 a.m. I woke up and was in so much pain I didn't want to move. Around 3:15, I knew I at least needed to get up and take ibuprofen if I had any chance of lasting until 8 a.m. When I tried to climb out of bed, my pain shot through the roof. It started underneath my clavicle on the left side and traveled down through my ribs and wrapped around my back, spasming. I slowly made my way to my kitchen, stopping every couple steps to catch my breath. I knew this wasn't normal and I was freaked out. As I made my way back to my bedroom, my only thought was to get back to my cell phone so I could call for help. I called my mom and told her what was going on and she urged me to go to the ER. I called my brother and my sister for a ride, but both calls went unanswered. I was trying to talk myself out of the pain, telling myself that I could wait until morning. Right then my brother called back and offered to take me to the hospital. 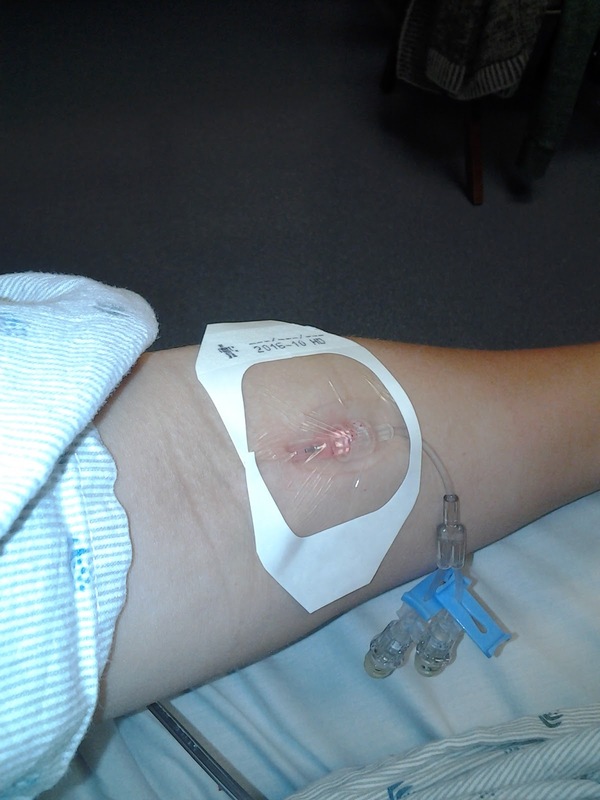 By the time we got to the ER, the spasming had stopping and it was just a dull ache that would get worse when I took a deep breath, pretty much the same pain I'd been experiencing all week. The ER was crowded and I checked in, then waited for 45 minutes for my vitals to be taken, then another 45 for a blood draw. I was exhausted and feeling stupid that I was even sitting there, certain that it would be nothing again. Finally, after two hours, I was brought to a room to see a doctor. When she came in, we went over my symptoms and I told her my history of having pleurisy. I also told her I recently went to India. She immediately added a screening on to my blood panel to check for blood clots. And so I waited for those results to come back. The test came back showing that my levels were elevated, but that doesn't necessarily mean you have a clot, they said. They wanted to do a CT scan to be sure. 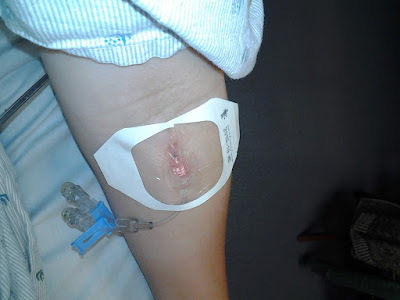 I was hooked up to an IV for the dye they inject in your body (SUCH a weird feeling!) and had a CT scan. Thankfully my step-mom Jackie came right before they were wheeling me off for the CT. When I got back into the room, she and I chatted for a bit before she stepped out of my room to take a phone call. While she was out, two nurses came in with two bags for my IV. I knew what that meant before they even said it: I had a clot. 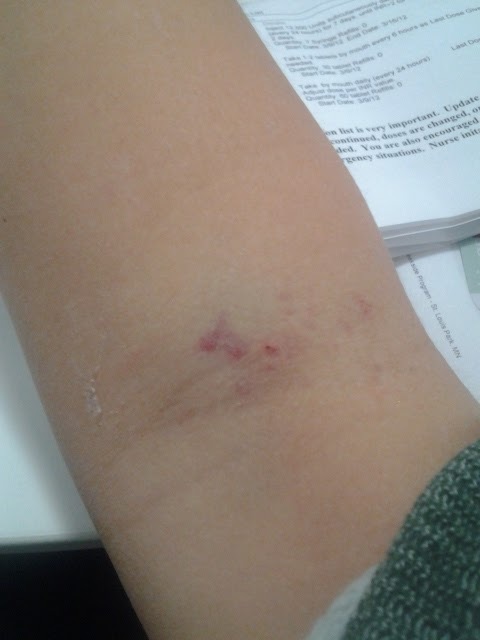 As they began to hook me up, the nurse asked if my doctor had been in to talk to me yet. I said she hadn't. She then told me that the CT scan showed that I had clots so I would be admitted and they were going to start a heparin drip immediately. Clots? I asked. Clots, like plural? Yes, she said. Your doctor will tell you more. My doctor came in and told me that I had several clots in my left lung and a few in my right, also known as a pulmonary embolism or PE. The CT scan also showed that because these clots caused a lack of blood flow to my lung tissue, part of my lower left lung was damaged. She assured me that now that I was hooked up to heparin, I was going to be fine but told me more than once It's a very, very good thing that you came in when you did. I would find out later that day that one in five people with PE die. I honestly don't know what would've happened had my brother not called me back. He likes to say that he saved my life. Either way, I'm really glad to be here. The rest of my day was filled with more IVs and needle pricks (one that even blew up the vein in my hand) and finaled with me giving myself a shot in the stomach, a task I now have to continue at home for the next seven days. 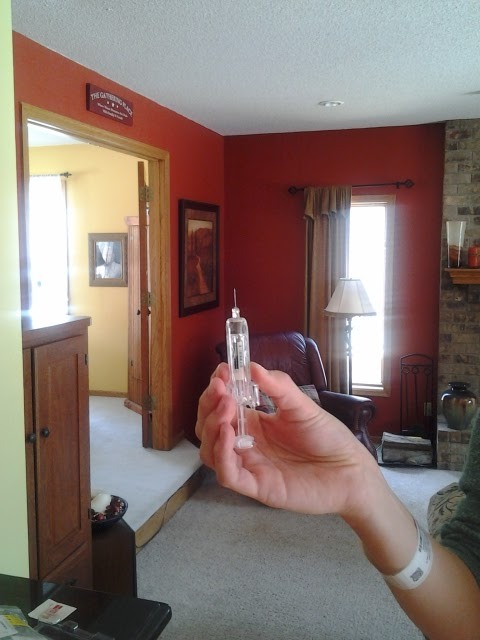 The aftermath of two IV attempts and a blood draw. You should see my other arm and both hands! In short, this is a pretty big deal. I'll be on blood thinners for the next 6-12 months, which affect everything from my diet (no foods that are high in vitamin k) to running (no running until it's approved by my MD, who I don't see for 1.5 weeks). The pain I was feeling is likely due to the clots pushing on nerves, something that should dissipate as they go away. For now, though, there's vicodin (which has it's own unpleasant side effects). They are also trying to figure out why this happened, including the possibility that this may be a hereditary condition. I have many, many questions, most of which will be answered in due time. So for now I get to be patient. I am so, so SO glad you're ok!!!!! That is SO SCARY. I am so glad that you are okay and got to the ER when you did. Will be thinking good thoughts for you! i just found your blog through ann's post today, and i have to say - good for you for knowing something was wrong and going to get help! this sounds so scary and i hope the road to recovery isn't a long one! I didn't realize it was this bad. Well, I think I did, but reading this makes it feel a lot 'closer'.